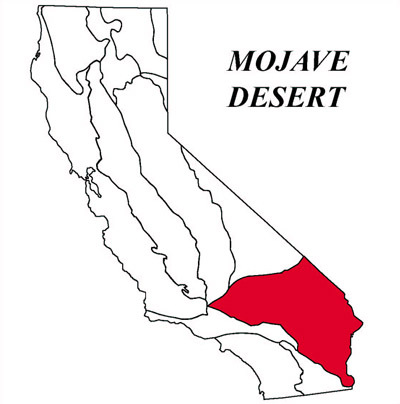 The Mojave is a broad interior region of isolated mountain ranges separated by expanses of desert plains. It has an interior enclosed drainage and many playas. There are two important fault trends that control topography a prominent NW-SE trend and a secondary east-west trend (apparent alignment with Transverse Ranges is significant). The Mojave province is wedged in a sharp angle between the Garlock Fault (southern boundary Sierra Nevada) and the San Andreas Fault, where it bends east from its northwest trend. The northern boundary of the Mojave is separated from the prominent Basin and Range by the eastern extension of the Garlock Fault.